Being in the Internet marketing space isn't just about knowing the latest trends or applying effective business strategies. Putting health on top of your priority is also a must. In this episode, fitness expert Scott Baptie talks about what it means to be healthy and how to achieve it by making small changes. 03:07 – Who can get the most value? 28:25 – Should you share your goals? James: James Schramko here, welcome to SuperFastBusiness.com. You’re listening to a podcast that usually covers topics around the Internet marketing type fields, and sometimes we go a little bit left or right of that. Today will be one of those occasions. We’re going to be talking about one of my favorite topics, which is food and eating. For this episode, I’ve invited Scott Baptie from foodforfitness.co.uk. Welcome. Scott: Thanks James. It’s a real pleasure to be on your show. James: I always enjoy discussing food and eating. It’s something everyone does. Someone might be thinking, Scott, why would I be interested in food or eating on an Internet business-related show? Could you explain this? Scott: Yeah. As you said, it’s a big thing. We’ve all got to do it. But it’s such an important part really, and I think so many people are bombarded with conflicting information and confusing information about food, specifically healthy food. We have this different interpretation about what it means to be healthy. And it’s often seen as being something that’s very different to what they do at the moment. It’s often characterized by boring meals, chicken broccoli and bread rice nine times a day. It’s often seen as an afterthought. Something that requires a lot of effort, a lot of time. Something that they maybe don’t really consider a priority when trying to grow their business. But at the end of the day, is there much point having a very successful, thriving business if your health isn’t where it should be? And if you’re always lethargic and tired and you’re not happy with your appearance and you’re potentially getting ill, then we want to minimize that so you have a perfect balance between a high-quality life being healthy and fit, and having a good outlook, and having a thriving business. So hopefully in this show, we’ll be able to help the listener maybe find that balance and develop a few habits that’s really going to improve their fitness without being a huge overhaul. So we’re trying to get this small change that’s going to give them a big impact. James: All right. And I think you know what you’re talking about. You’ve been on the cover of Men’s Fitness, not once but twice. Scott: Yes. I’ve been known on occasion to take my shirt off and be professionally airbrushed, but yes. I do workout, I practice what I preach. I think it’s quite an important thing obviously to stay in shape as well. Use the analogy of “You wouldn’t take financial advice from a broke accountant.” So it’s probably a good thing for people in this industry to stay in shape and be a positive image and project what they’re trying to help people with. James: With your business, you do nutrition plans for all sorts of people. Who do you think get the most value from the nutrition plans that you’re preparing? Scott: I think it’s the everyday person. We’ve experienced a lot of people come to us who have maybe been let down by following a traditional diet. So this idea of extremism is very popular, this fear really. When people think that they have to do something that’s very extreme, it might but cutting a bread or going on a very low-carb diet, or very low calorie diet, or fad diets are generally characterized by complete removal of something or including something or including something that’s a huge quantity. And the problem with diets James is that it’s like a boat or a book. There’s a set end point. You do something that’s very different for a set period of time and then often, you just go right back to where you were at the beginning again. All the weight comes back on because it’s seen as something that’s very different. You can’t wait for it to be over. But what we try and do is show people that you don’t have to have these extreme approaches in nutrition. You don’t have to flip flop between this diet or this bootcamp; this is what this guru says. It’s about changing your routine at the moment and creating small habits and probably having more of certain foods and less of others but not talking about complete removal or adding in copious amounts of food you don’t like. And people are, I’m eating pickled broccoli again. If you don’t like broccoli, don’t eat broccoli. There’s loads and loads of delicious vegetables that you can eat that you probably do like rather than trying to force yourself something that you simply don’t because somebody told you it was the right thing to do. So I think, going back to your question, we have the most success with just normal people who are wanting to try and improve their fitness, their physique, potentially lose muscle, maybe somebody wants to build fat, who thinks that they hadn’t had much success in the past and they actually want to lose weight and never gain it again. James: Right. So what I’m hearing is that it’s about creating better habits and a sustainable thing that you could just rely on as your baseline now if it’s going to get you the results you need to get, that it’s not some spike or one time exertion that is going to revert back. Scott: Definitely, definitely. Because that’s it. I’ll use an example of low-carb dieting. Low-carb dieting can work. But if you’re someone who loves pasta or bread or rice or something like that, and you cut out for, say, 12 weeks. At the end of the 12 weeks, when that rule of that said diet has been lifted, you’re just going to go right back and start eating more pasta or more rice. So was it really sustainable? Probably not. The same when people go on this horrible shake-based diets or this juice detox cleanses when they have nothing but juice. I mean that is not sustainable because the moment that it’s finished, they’ll go right back to solid food and eating how they did before, which will probably destroy any of the progress they’ve actually made and potentially make them feel worse. So it’s probably about looking at the red flags as we call them. So we say, “What things are holding you back at the moment?” “What’s the simplest thing that we can change?” And it can be something so basic, like including breakfast or increasing the amount of protein someone eats or simply getting more fruit invention. It doesn’t have to be “Right, none of these for the next 12 weeks,” because that never works. And if you look at the studies, looking at long term dietitians, those who have the more flexible approach, so the people who are less extreme and include the widest amount of foods, they have the greatest long term success. And loads and loads of studies show this. So people who have lost a lot of weight and kept it off are those who have taken a flexible approach. And probably included some form of exercise as well, but there’s really a place for extremism. I mean moderation is harder than extremism. Some people think that it’s an easy approach just to say none of these. But moderation is slightly harder, but the rewards are far, far greater. James: Right. So why do you think people do try this flawed approach? How is it possible, with so much access to information, so much accountability on social media, that people could (a) advertise these products, and (b) the public are continually following these fads, when there’s enough evidence to show that none of them work? Scott:Yeah. There does seem to be change happening, so more people are asking for evidence and proof when people make these claims but on social media, anyone can post anything. It’s unregulated and there’s a huge element of bias that happens. So someone may have experienced positive changes using some approach, and then they become so attached to it and think that’s the only way for them to lose weight, and they tell everyone about it. So again, I might use low-carb dieting. Someone has success in a low-carb diet so they become very, very attached to it and proclaim that it’s the best thing to do. Also I think there’s the marketing elements as well. If people knew how to market themselves or their product or their book, then it does due people into thinking that it’s the best thing to do. It’s the best thing for them. And it’s really not the case. Again, it comes down to this idea of extremism. So I think bias is a huge thing. People are probably trying to make a fast buck and perhaps being influenced by people who don’t look at the evidence. I think that’s a really big thing. Any time somebody tells you something about nutrition and fitness, always ask for evidence. I think that’s a big thing. Always try and be critical, and if someone says, use the myth of you can’t eat carbs after 6 o’clock, always say, “Well, why is that?” And ask that person can they actually back up what they’re telling you. That’s usually the best thing. Try and find some evidence-based sources on the Internet. So if you stop viewing things in black and white, it’s usually a grey area. So it’s not always, “This is the single best thing to do,” or “You can never eat that.” Context is the key. Context is really a big issue. If we look at something, like chocolate. Looking at chocolate, rather than seeing chocolate as always bad, it depends on the whole context of the diet, because if you have someone who does very little exercise, eats very little fresh food, eats a lot of stuff that just microwaveable meals, and eats a lot of chocolate, then yeah, chocolate’s probably a bad thing, and we’d probably want to try and cut out as much as possible. But someone who perhaps exercises quite a lot, eats lots of fruits and veggies, is in good shape, the occasional bite of chocolate, is it bad for them? Probably not. So that’s an example of not viewing something as always good or always bad. It really depends. So it’s this idea of the grey area. James: Right. So how did you learn the information and avoid having bias or getting tricked by peer comments or the classic science has proven-type general tagline. Scott: Yeah. I think, when I look back at when I first started, I did have an element of bias and I look back at things I talked in absolutes. And now I look back and think, “Well, that wasn’t the right thing to do.” But I am not afraid to say, “I originally thought that was the best thing, and now it’s not.” Whereas a lot of people perhaps get a bit stuck in their views and they’re afraid to change because they think they might lose face. But if someone can give me more evidence that shows that approach I take is not the best, then I am more than glad to look at it and see who I can change. But I’m just finishing up my Masters in Applied Sports Nutrition as well, which obviously is very evidence-based. I stay on top of the research as well. That’s really a big thing, like I really read the studies that come out and not just reading the abstract, looking right at the study to see as it relevant to the people I was talking about and was it endorsed by a company that may have a big involvement or an interest in that showing us a certain outcome. And speaking with respect to peers in the industry, so there’s lots and lots of great people that are on social media that are perhaps based at universities or publishing a lot of research that they’re great to network with and seeing their content and they critique some of the charlatans. But they’re asking perhaps some of the people who are very dogmatic in their approach for some of evidence, and we’re trying to challenge the whole, just make it more open and more transparent really for people. James: Right. So you’re basically waiting it out for the public. Scott: Yeah, yeah. And when we are presenting or when I post up content, I try and give some references as well to explain why I’m posting this. Or if someone has a conventionally held belief like again, “You must not eat any carbohydrates after 6,” we’ll give them some evidence behind why that’s not really the case, so that they can see it’s not just an opinion or anecdote, it’s actually what a large volume of the evidence of what the science shows us. James: Great. So far I’ve picked up that if we’re removing everything or adding one thing in excess or with being extreme because you’re only low carb or we’re going to the absolutes, then that’s a sign that we might be heading down the wrong track. What are some of the other mistakes that people make? Scott: Well that’s a big one. We touch on that point briefly but forcing themselves to eat food that they don’t like is another big one. If you’re not really a fan of fish, it doesn’t really make sense to force feed yourself fish because somebody told you that it was a good thing to do, try and get your protein from other sources. If something sounds too good to be true, it probably is. So if any food proclaims to be this miracle fat burning food that you must include several times a day like canned pepper, and I’ve seen people adding canned pepper to oatmeal and porridge and it starts getting ridiculous. So there aren’t any fat burning foods. There isn’t really a single food that’s going to cause you to gain weight in isolation. So seeing these little things of click-bait on social media, “The 5 foods you must not be eating,” or “The 5 foods you’ve got to start eating,” I’d avoid that. The media quite like scaremongering style approaches to again nutrition stories, like X food causes cancer or is the main cause of diabetes, when often it’s maybe not that food. Maybe the singular cause, perhaps the people who have experienced that problem are also those who are the least active or have the poorest diet overall. But yeah, just staying critical is a really big thing. If something sounds too good to be true, it probably is. And if you’ve always been doing something that works for you, it’s healthy, you’re enjoying it, you’re making progress, then it doesn’t make sense to suddenly make a huge change based on something that you’ve just read or heard from some bro down the gym. If it’s working, it’s healthy, I’d stick with it and avoid trying to overcomplicate it. I’ll give you another one that’s a big issue. Missing the forest for the trees. What they do is they’ll micromanage. So rather than focusing on the basics, like can we have some more fruit in the diet, more veggies in the diet, can we increase the protein, can we minimize hunger and so on. Some people get really zoned in on specific aspects like must have a protein shake within x minutes of finishing the gym, or must have this supplement instantly. And often, these things have such a small impact compared to the larger picture that it’s important to really make sure you’re nailing the basics rather than trying to fine tune it to such a high degree that it’s maybe not relevant for you or it’s not really that significant until we can fix the basics first. James: Great. OK. So I’m always keen to find out what we should be doing. If you were speaking to someone like me, I guess I’m a white collar worker in a way, who surfs everyday, I’m getting enough sleep, I’m working in phases where I’m doing batched productivity, lots of rejuvenation time. What should I be eating? Scott: First, I would like to have a look at your food diet to see what you’re doing at the moment. But I would say that when I speak to people, 90% of them, probably more fruit and veggies. People are thinking, “Oh come on, I do this one. Five servings of fruits and veggies. Tell me something more exciting.” But it’s really one of those basics. People underestimate the quantity and quality of food they’re eating. So they think, “Oh yeah, easy. Five servings of fruits and veg a day.” But then when we start looking at their food diaries, well, maybe they occasionally get five a day often and there’s three or two. So that’s really a big one. Can we get more servings of fruits and veggies. The reason why we’re actually doing that other than that we know it’s filled of micronutrients and it’s very nutritious, green veg is very fibrous. Fiber helps fill you up. And that’s one of the big problems and that’s one of the negatives associated with “healthy eating” is that you’re always hungry. So we try and get more green veg in the diet. They naturally helps fill you up and it’s going to increase the amount of micronutrients that you’re taking in. So for your evening meal, can we have about half the plate full of veg, same with your lunch. And can we put in some fruit, potentially as snacks rather than going for a pack of crisps or a chocolate bar. Another thing is probably including some protein at breakfast because studies have shown that people who include protein at breakfast have better eating habits as they go throughout the day. And this is also because protein is seat eating. So it helps fill you up too. So we can include some protein at breakfast, possibly having some eggs, maybe having some smoked salmon if you’ve got very highfalutin breakfast taste, or even just some continental daily meats rather than putting a load of jam and honey on your toast, potentially putting in some turkey and some ham, including some dairy as well. Yogurt is a great source of protein. That’s another habit that helps. Doing some planning too. So I think for the busy executive, the entrepreneur who’s listening to this, time is going to be an issue. And they think, “OK, that’s great. I understand that. But I just don’t have the time to do this.” What I suggest is start cooking in bulk or do some planning at the start of the week. So rather than just doing reactive cooking, rather than just, “I’ll go home, I’m hungry. What is there?” We’ll try and prevent the hunger. So we’re looking into it potentially. At the weekend, you’re going to cook up a huge batch of some kind of stew or a bolognese, or some kind of healthy curry or cook up a load of chicken on the barbie so that you’ve got quality food throughout the week that you can grab. It is going to really minimize the time. In our household, I really cook for just the two of us. I cook as if I’m cooking for six or eight of us. Big pot, slow cooker, so there’s loads of meals throughout the week and I can stick some in the freezer. It just really cuts down on the time required. And it also saves food as well because some people buy a load of veg at the start of the week and won’t have the time to cook it because they may be busy, and end up throwing it out. So if we can cook in bulk, cook all the veg, stick it in the freezer. And once it’s made, then you’re onto a winner. James: Right. So if you were to get a big pot and put vegetables and some diced meat in that and cook it up, that’ll be a pretty nutritious meal. Scott: Yeah. I mean there’s so many recipes out there. If you can get some kind of protein in it, some kind of vegetable, and then probably some kind of carbohydrates as well, and throw in a load of veg, I mean you can start to sneak veg into other foods as well. Spinach, you saute it up, it disappears. If you’re a fast eater and you don’t like much veg, you can. If you’re cooking fajitas, you can put more vegetables in there rather than just onions and peppers. There’s loads and loads of recipes out there. If you just Google “healthy recipes” or “high-protein recipes” or something like this, you’re going to see a load of choices. What I like to do is take traditional recipes and try and make them a little healthier. So if there’s a load of cream in it, or a load of butter, or something that’s really jacking the calories up, can we make some kind of alternative and swap it, maybe put some more veg to just increase the protein, the fiber, and make it a bit more nutritious, and little less calorie dense. James: That’s a great tip. That’s certainly a big takeaway from me from this is just make existing meals a little healthier by dialing in some veg. Scott: Yeah. Often we don’t realize just how much calories are in the food that we’re eating. That’s a huge thing. If you look at studies, we are generally, really bad at estimating the amount of calories that we’re consuming. Even dietitians have been known to underestimate their calorie intake by 200 calories and this increases to some people being 50% off. So they think, “Oh yeah, what about 2,000 calories,” when in reality, they’re on 4,000. So I’m not saying that you’ve got to count your calories, not at all. But we’re trying to create habits here that means you don’t have to meticulously log everything. But it’s just to be aware of what you are eating and especially some people will say, “I don’t understand. I’m not losing weight. I hardly eat anything.” But the foods that they are eating are very calorie dense. So if you imagine a typical lunch, say you’ve got a sandwich that you’ve bought from the supermarket with a pack of crisps and a kind of fizzy juice. James: Come on, even I know that’s ridiculous. Scott: You’d be surprised. I mean that’s pushing. It depends on what the sandwich is. You could be over a thousand calories for that meal. But if you’ve got a nice chicken breast, you’ve marinated it and cooked it in the barbie, you’ve got some of your favorite veg and a fist-size serving of carbohydrate, that’s almost half the amount of calories, it’s a much greater volume of food. It’s going to fill you up more but without the amount of energy coming in. James: Fantastic. OK. So in finishing up, let’s just do a little summary. We’ve talked about why it’s important to eat well. No doubt if we eat well, we could actually live longer and we could have more energy for when we are doing our activities, whether that’s work or play. We’ve covered some of the signs if you’re doing it wrong, removal, addition, extremes, doing things you don’t like. We’ve talked about some of the easy ways to move forward by introducing more fruit and veg, fiber, protein, making better choices, being aware of dense calorie-type meals, pre-planning, batch cooking. Also I imagine the lesser humans interfered with something, it’s probably better for you if we can go a little more direct to the source of where it was coming from rather than processed, and canned, and packaged would probably be healthy too, right? Scott: Yeah. Cooking from scratch is a great thing because then you know what’s in it. I mean sometimes pre-made healthier meals are potentially appropriate if you’re really in a rush. But trying to cook from scratch is a big thing. One thing James that we haven’t touched upon that I think is so big is the actual habits or making a small improvement, because that’s really what we’re looking for. James: Come on. Mexican gods ate chocolate, didn’t they? Scott: Again, I’m using chocolate. But if you eat chocolate every single day, a huge improvement is going to be having that every second day. James: Right. So it’s just saying, well this is the benchmark of where I was and I’m just going to retreat from that a little bit and that’s starting to make some progress. James: And you could do quite a lot in one year, can’t you? If you start modifying your behavior. Scott: Yeah. I would suggest, if anyone’s listening to this, to pick one or two habits, and practice those habits for the next month. It’s only going to be two things. One might be, “OK. I’m going to have protein for my breakfast.” The second might be, “I’m only going to have chocolate on days I exercise,” or “I’m going to make sure I have half a plate of green veg every single meal.” And then do those two habits. James: So this is the same then if someone’s having a beer everyday, if they just had a beer every second day, that will be an improvement? Scott: Yeah. Huge improvement. I mean that’s a 50% reduction. James: We didn’t really cover this. But I guess you can hardly talk about food unless you bring up the topic of exercise. And it’s something I went through. I actually changed my body by about 20 kilograms of say in an 18-month period just from surfing once a day, sometimes twice. I found that that actually made me a bit hungrier. However, I felt like I wanted to eat a little healthier because I wanted to be able to paddle better and stay out in the surf longer. Scott: Yeah. Combining the two, exercise and improving your nutrition is such an award-winning combo. But again with exercise side of things, if somebody doesn’t do a lot of exercise, I wouldn’t rush into trying to make this commitment that you’re going to train five times a week because it’s not going to happen. Because if you say, “I’m going to start going to the gym five times a week,” you might do that for the first week. And then you might go three times, and then you look back and think, “Oh, I’ve only been twice. I’m an absolute failure.” And it’s negative. Whereas if we say, “Well, I’m committing to go into the gym once per week.” Or “I’m going to go for a half hour walk on a Tuesday and Thursday lunch time.” And so we set the bar a little low, and any more than that is going to see a huge improvement and you think, “Wow. I only was planning going for a walk twice, and I’ve managed four. That’s awesome. That’s twice as much as expected.” So rather than I get this idea of don’t commit to the absolute optimum, just try and make an improvement and build upon it. James: I’ve haven’t seen many happy runners. It fascinates me. They all look like they’re strained and stressed, and they’re about to drop dead. Scott: I personally don’t enjoy running. But for my cardio, I play squash, I play badminton, I go out in the bike. James: I do surf, and I walk about 5,000 or 6,000 steps a day. Scott: We could surf here but we need to get a much thicker wetsuit than you have. James: Yeah. I don’t blame you. But I found doing something I enjoy that gets me fit despite the fact that I’m exercising is really the key for me. But if you’ve got five a side arranged with your group of friends, or you’re meeting to play football, there’s less chances you’re going to give up on it. So that’s how you gain the social aspect of getting people involved. The social aspect is a huge thing and healthy eating as well. Trying to get people to have a support network, or people who are doing the same thing as them, or let everyone know what you’re trying to make an improvement because studies have shown, if you have three or more people in what we call your social support group, you have 176% greater chance of making progress. So rather than just saying, “OK. I’m going to do this habit,” or “I’m going to eat this or not eat this,” tell everyone about it, get your partner involved, get your children involved, get your friend, get a gym buddy, have people that hold you accountable because it’s just an absolute winner for success. Accountability, and mentorship, and motivation that others can give you. James: OK. Well that’s a good tip too. I’ve heard some contrary advice from Derek Sivers, which is if you share your goals, you’re less likely to achieve them. But maybe it falls under a different category. James: They’ll give you an assist? Scott: Yeah. They’ll go, “You look great. Have you lost weight?” You say, “Well, yeah.” It’s definitely worth it. It gives that person that spark to keep going. James: I actually look at images of me from two years ago, and I look fat. But I didn’t notice it at the time. Scott: Yeah. Well we get our clients to take photos. They do the weekly photo, front, back and side. It doesn’t have to get blasted on Facebook or Instagram. It’s just there to track progress because when you see yourself everyday, then you forget what you may have looked like back then, and it can be hugely motivating if you look back in your photos from four weeks, eight weeks ago, and you keep going. I recommend that to a lot of people. If they are making some changes, you’re setting a goal, take some photos, and see where you are at the moment. Just another thing, there’s so much that we could talk about on this. Goal setting. What I try and encourage people to do is rather than have an idea, so an idea is “I’d like to be fitter,” or “I’d like to lose weight,” or “I’d like to be stronger,” we need to quantify it and make an actual goal. So if you are thinking about weight loss, we pick a goal. So maybe it’s one to two pounds a week. So if your weight is X weight just now, in 30 days’ time, because we like to do short-term goals, and you lose one to two pounds a week, it will be between here and here. Same if you’re trying to improve your running or you’re trying to get stronger. We pick a goal, we work out the habits you are going to do, and then you work towards it rather than it just being an idea because if you’ve quantified it, and you have this clear idea of how you’re doing it, when you get there, you know what’s worked. And then you can replicate it. So you say, “Well I did this for this period of time, it worked so well, I’m going to try it again. Let’s see where I can get to.” Let’s pick another target and work towards it rather than looking at it just being a long-term thing. So often, people might, again I’ll use an example, weight loss, “I want to be this weight again,” or “I was this weight in my 20s that’s why I’m aiming for it.” Well that’s good, but let’s break it down and make it into much smaller bite-sized chunks, and it’s going to be far easier for you to achieve. And it’s going to be far more rewarding because if you achieve success after 30 days, you’d think that’s awesome. A few days, it works rather than if it’s a six month goal, and after a month, you may have already done really well but you’re still thinking, “Oh, how long I’ve got to go,” rather than short term achievement, mini-win. Dan Sullivan talks about this mini-wins. That’s a big thing of this. I like the idea of a mini-win. James: Yes. And we don’t go past 12 weeks as a time frame in our business coaching environment. And we have daily progress journals, and so many things mirrored here. We’ve got a peer group support and that’s how they get success business wise. Do you think Scott that it would be fair to say if you were eating well, and feeling good, and looking good that the time you spend on your business would be more effective? Scott: Definitely. A really interesting one, James is people say “I don’t have time to work out. I’m just so busy I don’t have time to exercise, I don’t have time to eat healthy.” But what happens if they commit, if they block out time in their diary, so they, “Half an hour,” again I’ll use the example of the Tuesday lunchtime walk. They’re going to be more efficient in the Tuesday morning to get their work done so they can go for this walk. And the walk is probably going to energize them, it gets them out of the office, it gets them moving rather than sitting at a desk, which is a nightmare for posture, and then they come back, they’re more energized, they feel great and they’re going to be more productive in the afternoon. So from the endorphins perspective as well, you train and you feel great afterwards. So that’s why sometimes, we say, let’s get up first thing in the morning, and fit in a little bit of exercise if you can, and the whole rest of your day, you’re going to be looking back and think, “I exercised this morning. I feel great.” Saying “I don’t have time to exercise,” you just have to find a way that you can make the time and find a way that you can fit in some form of exercise. It doesn’t have to be driving a half hour to go to the gym and then driving half an hour back. Simple walk, bodyweight exercises, downloading yoga apps, downloading apps that have workout routines that you can do in your living room; it really would make you more effective and efficient, more productive, and it makes you feel really good as well and more positive about what you’re doing. James: Yeah. And I think it’s so important. I even have it in my Profit Leverage cause, which is free from SuperFastBusiness.com. It’s in the top header. I talk about eating, and moving, and sleeping; all the things that I found made a huge difference to my own business performance. And I really think that you can eat your way to more profit, which probably what we’ll call this episode. I just want to say, Scott, it’s been such a pleasure having you along on the show, and not just because I feel like I’m talking to Ewan McGregor, but because you’ve got such good ideas around a topic that affects all of us. Let’s face it, most people are eating two to four meals a day, and that have to be a takeaway in this episode for every single listener, whether it’s avoiding extremes, or adding in a few veggies, or doing some bulk cooking, or just going for a walk every now and then. But I think probably the best point of all is the one where you can just make a small change that gets you one step better than where your current baseline is, whether that’s one less beer a week or one more walk a week, or a few more veggies a week. You could actually have quite a profound impact over a longer period, say a year from now. Scott: You know it. Exactly. Small change that’s going to give you a big impact. James: Well thanks Scott. 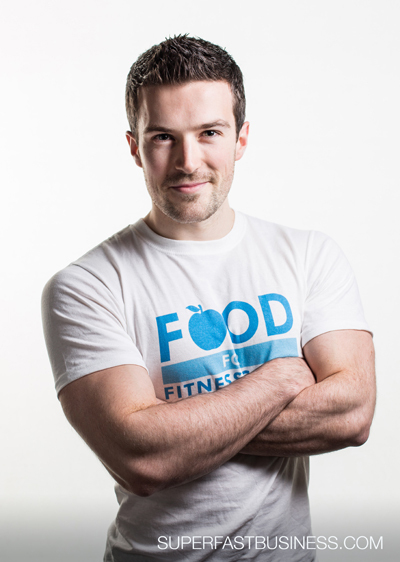 And if you want to find out more about Scott’s nutrition plans, go and have a look at foodforfitness.co.uk. It’s been a real pleasure, and I appreciate all of the tips you’ve shared today Scott. Scott: Thank you James. It’s been great coming on, and I really hope the listeners have been able to take some value from that, so thanks for the opportunity. Speak your mind: What eating habits are you going to change after listening to this episode? Thanks for posting this up James, I had a lot of fun. I’m sure nobody will notice :) Thank you for sharing your info. Thanks John. Glad you enjoyed it.